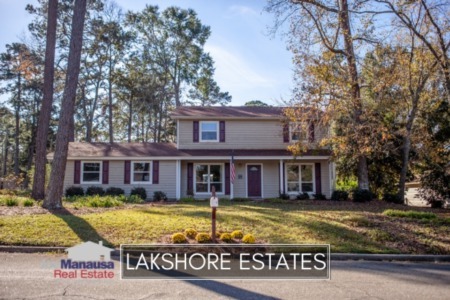 Lakeshore Estates is a Northside subdivision featuring three and four bedroom homes that were built from the 1960s through the early 2000s. 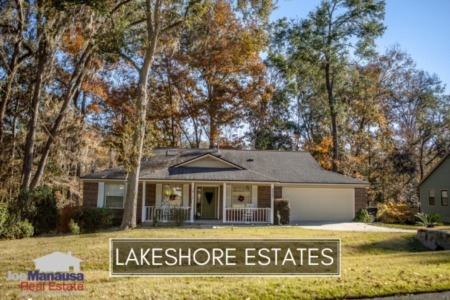 Much like other neighborhoods that are located on the West side of Tallahassee's east-west division line, Lakeshore Estates often does not appear when people are searching for homes, but it really should. The location is prime, yet the home prices reflect the glut of the West side of the Tallahassee real estate market. For the three real estate graphs found in this report, you will find the number of closed home sales for each year (red columns, measured on the left vertical axis), and an important real estate statistic shown in blue (measured on the right vertical axis. It is important to note that while the graphs and table will update on a regular basis, the analysis of the information that we provide is current through the first few four weeks of July 2015. Average home prices have risen more than 8% thus far in 2015, and now remain 20% below the peak of the market prices established in 2007. Average home prices are still rising as the average recorded sales price is $160,520 for Lakeshore Estates in 2015. Home sales activity this year continues strenthening and will possibly surpass last-year's ten year high. Through late July of 2015, there have been 15 closed home sales in Lakeshore Estates. Average home values in Lakeshore Estates rose 8% last year, but have fallen 1% thus far in 2015. Earlier in the year, average values were far lower than what they are now, and I pointed out in our previous report on Lakeshore Estates that it was likely a mathematical anomoly and would correct itself as the year moved on. It has. Through the fourth week of July, the average value of a home sold in Lakeshore Estates has been $92 per square foot. This is about a 1% decline since 2014, but still 28% below peak of the market values recorded back in 2008. Home sellers are still sitting on negative equity in many situations. The average home size sold in Lakeshore Estates typically falls in a range of 1,500 to 1,800 square feet, and this year buyers are reaching for the top. The 15 home sales thus far in 2015 have averaged 1,728 square feet. The following list shows home sales going back to 1991 in Lakeshore Estates. I hope you enjoyed our July 2015 update on home sales in Lakeshore Estates, please feel free to drop me a note if you have questions not covered in this report.